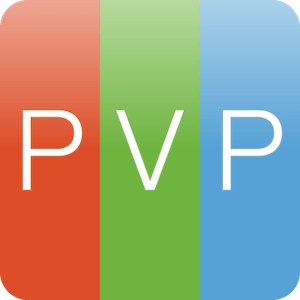 ProVideoServer (PVS) is a dual channel video playout server that replaces our former ProVideoSync, which was in use by organizations all over the world for the synchronized playback of two channels of broadcast-quality video. The world changed quickly; codecs like H.264 that were originally suitable for web video became of a better quality, distribution of content over the web became more desirable, remote control capabilities in video switchers became more widespread, and the appetite for even more video channels began to grow. So, we went back to the drawing board in an effort to address these modern requirements and re-imagined and extended the original scope of PVS. 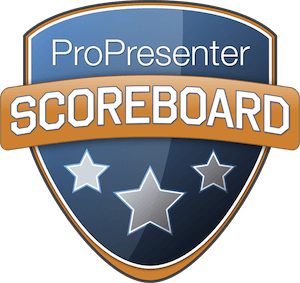 The result of these efforts is a brand new playout server product with a slightly updated name that’s more appropriate for what this product can do. In short, all the things our customers loved about ProVideoSync, with a bevy of new functionality that will appeal to a whole new market of users at a price point that will, we believe, surprise and delight. ProVideoServer can accommodate up to four independent channels of 1080 from one system. 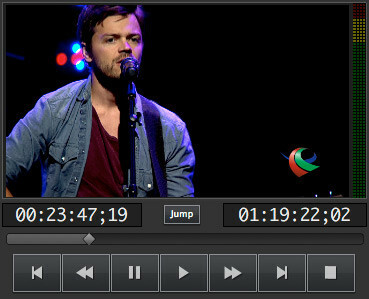 This Mac-based software outputs video out natively through HD/SDI (Blackmagic output devices only) and can utilize a range of commonly used codecs such as ProRes, MPEG 4, and H.264. 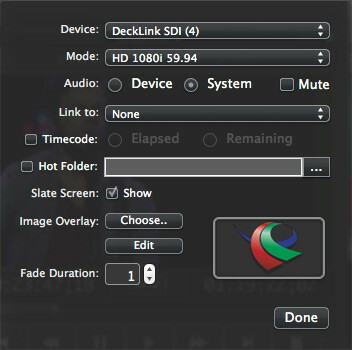 All video SD and HD resolutions are supported and video is resized and retimed on the fly to match the output setting. Real time Video Scaling and interlace/de-interlace are standard. Channels are purchased on an individual basis as needed. The software is extremely easy to set-up and use and works on any Mac meeting the system requirements. An additional exciting feature of the software is a per-channel count up/down timer output via VITC (VANC) through supported cards. PVS also outputs up to 8 channels of audio with on-screen meters for visual confirmation. Equipment: MacPro Tower with Blackmagic DeckLink Quad card and 2 SmartScope Duos in mobile case. This could also be done with an external PCIe expansion chassis with a current MacPro Thunderbolt Mac. Using industry standard ProRes codec varieties, it is now possible to easily record one or more channels within ProVideoServer, complete with embedded timecode and multi-channel audio. Time slip functionality, much like a DVR, allows for the immediate playback of a video that continues to record. As such, you could begin recording an incoming stream and start playing it back moments later to another ProVideoServer output. 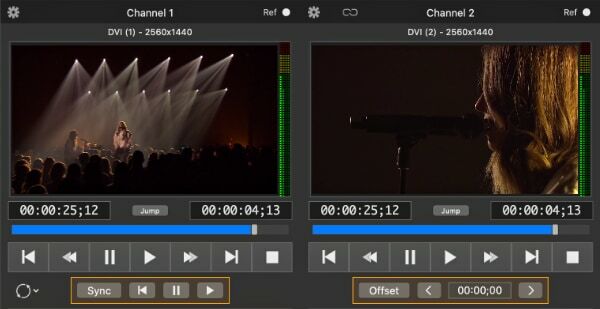 Using the synchronization capabilities of ProVideoServer, this makes an ideal dual-input, dual-output time slipped media record and playout server. PVS channels purchased can be used either for recording or playback. Time-slip recording with simultaneous playback requires two separate channels per stream. ProVideoServer allows 2 or more channels to be synchronized for frame accurate playback. Two sets of two channels can also be synchronized. A unique feature here is the ability to advance or step back a frame of video at a time to offset any latency due to downstream pipeline. This offset can be adjusted in real-time and on a per channel basis. For easy control from a video switcher, PVS has several communications protocols included as part of the solution. 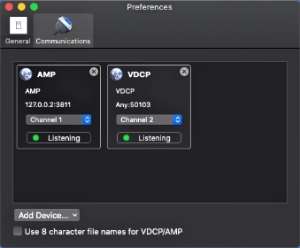 These include VDCP and AMP and allow the user to trigger clips directly via a switcher from any channel. The slate screen is a great feature that loads after you select a clip and before it plays. It summarizes the name, location, format, size, and duration of the clip as well as giving you 4 snapshots of different times in the video. This is great in case your videos all start on black – it allows you to see different parts of the clip so you’re certain it’s the correct one. As soon as you hit the play button, it goes away for the live output. 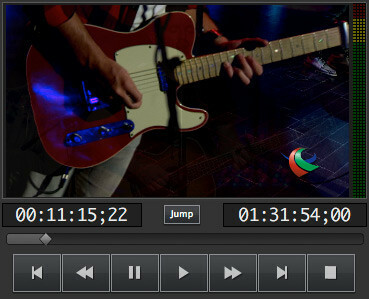 The graphics layer allows you to composite a still image on top of your video. Each channel has its own graphics layer. This is perfect for any logo bugs you want to appear on one or more videos. You can place an image anywhere on the layer you want it and have it fade in/out at the speed you wish. ProVideoServer is Mac only and delivered as a download with license keys are sold on a per channel basis. This pricing model allows the system to grow with an organization. Also, our licensing model allows you to install channels flexibly. For example, a machine can be used for one weekend with 4 licenses, and the same licenses can be deployed on two separate computers the next week creating dual two channel systems. This is of particular value to multi-site organizations and rental companies. Up to four channels can be purchased and used on one system. Upgrades from the former ProVideoSync can be purchased at 50% off retail price for the first two channels. Additional channels (3 & 4) are purchased at regular retail price. Software licenses cannot be transferred (sold or donated) to another organization or individual.